2012 Documentary about Coal Diggers and "The Billy Marks"
Music video "The Hard Coal Navy"
Northeast Pennsylvania has the largest deposit of anthracite, or hard coal, in the world. For 200 years this coal has been mined and brought to the surface. On the surface, a significant amount of this coal was washed into the Susquehanna and Delaware watersheds either by heavy rains or from the era when coal was washed with stream water to remove dust. In at least one location, coal was actually transported from mine to breaker by a creek. No boat or barge but simply dumped in a creek, near Mauch Chunk, and washed several miles downstream where it was captured and processed at a breaker. For most of the 1800’s there was no market for smaller coal (pea and rice) and was considered waste. Much of this “waste” was dumped directly into the river. This makes the Susquehanna and Delaware Rivers unique. They are the only 2 rivers in North America with large amounts of anthracite coal. Bituminous coal, or soft coal, is found throughout the Western and Northern section of Pennsylvania. However, when bituminous coal is washed into creeks and river it is crushed to dust by rolling on the bottom and rendered useless. Anthracite is hard enough that it maintains its structure and deposits in large piles in the river where the current is slow; behind bridge piers, behind islands, at the end of shallow areas, and behind bends in the river. Shale, sandstone and gravel have densities ranging from about 1500 - 2000 kg / cubic meter. Anthracite has a density of about 1100 kg / cubic meter. Anthracite’s lower density causes it to deposit together in piles on the river bottom separate from other rocks. An article in The Morning Press on February 22, 1938 (Bloomsburg) offers some local information worth presenting. “The dredgers take to the water in the spring, the latter part of March or early in May. If the waters have been particularly high the coal is carried further down stream and is not profitable for local dredges. On the other hand if the water is too low the boats cannot navigate advantageously and in all probability large quantities have not been carried southward. Certain rights and privileges are honored among all dredgers. In the spring the proprietor lays out his plans for the season and when a bed is found a buoy is placed at the head of the coal. Other dredgers recognize this and look elsewhere for beds. The endless bucket-line tube of the coal dredger is rapidly being replaced by the more efficient centrifugal pumps, with a six-inch intake and discharge. 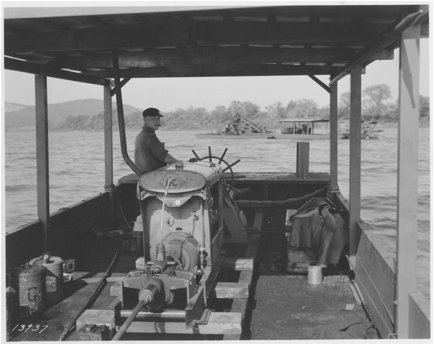 The coal is pumped from the riverbed onto the tops of flat boats, with the excess water draining overboard. Under normal conditions some 100 tons are dredged daily. 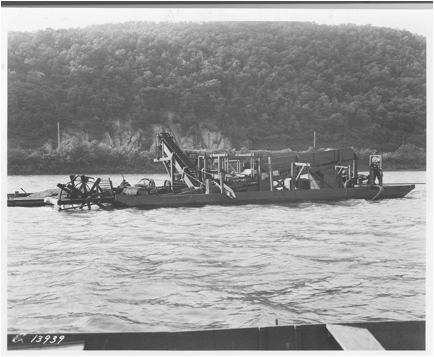 Beginning in the 1950’s environmental regulations, meant to protect the river ecosystem, drove the coal dredgers out of business. Mining operations upstream were no longer allowed to dump waste coal (which often contained usable coal) into the streams. To the best of my knowledge, Mr. Sudol was the last to operate. I last witnessed his dredge in the river, near the mouth of Kipps Run, in 1996. As far as I know, no one has dredged the river since then. Several people have told me that Bucknell University, Lewisburg PA, used Sudol’s river coal and mixed it with bituminous coal at the steam generation plant. In 1995/1996 Bucknell switched to natural gas. This unique part of American history covered a century and influenced the lives of thousands of local people. 3 Engineering & contracting, Volume 63, Issues 5-6 By Halbert Powers Gillette June 19, 1918. 4 Jim Charles. Isle of Que River Guide, Selisngrove PA.